The linked resorts of Hakuba 47 .nd Goryu form Hakuba’s most popular hill in terms of visitor numbers. Both resorts can be ridden using the same lift ticket. Hakuba 47 is Hakuba’s newest resort and a young, snowboarder-friendly vibe emanates from its excellent terrain park. At the top, it links to Goryu, named after the four diamonds-in-a-diamond peak of the majestic Mt. Goryu in the distance. Goryu the resort has great views, wide intermediate slopes, and plenty of choice for beginners. With numerous events throughout the season and lots of customer-friendly touches (yes, cowgirls! ), we think you’ll see why these resorts have grown in relative popularity even as the Japanese population as a whole has moved away from skiing. 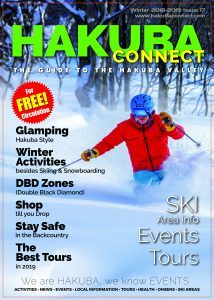 Hakuba 47 – the name comes from “four seasons, seven days a week” – has a single base area with a large, free car park. From here, the distinctive dark- green gondola takes you on a short journey alongside the kickers and the half-pipe to midmountain. A short run to skiers’ right takes you to the quad lift, Line C and from there, it’s a final short hop on the Line E pair to the resort top and the Goryu slopes. 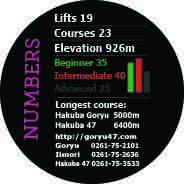 On the 47 side, ride the mid-mountain courses next door to the park or better still shoot up to the top lift linking 47 with Goryu. This season Hakuba 47 will have a dedicated kids skiing area complete with magic carpet to get up the hill. Note that beginners can access the upper slope shared by 47 and Goryu, enjoy the views, and then ride down either gondola if the descent seems too long or daunting. 47 can be ridden from the resort top to the base along cat tracks, but the lack of gradient in some sections makes it hard work for snowboarders or skiers without poles. At 47, a top-to bottom run down Route 1 from the top of the quad offers about 600 meters of vertical at a steady 20-25 degree pitch. Due to its overall northeasternly orientation, this course is usually rideable to the base even at the resort’s closing in May! Routes 2 and 3 off the quad at 47 both exceed 30 degrees, with the latter mostly un-groomed. It’s about deep AND steep, so the main attraction at 47 is the runs off the quad. 47 has a managed tree skiing program called the Double Black Diamond Club, so sign up to hit some interesting terrain. 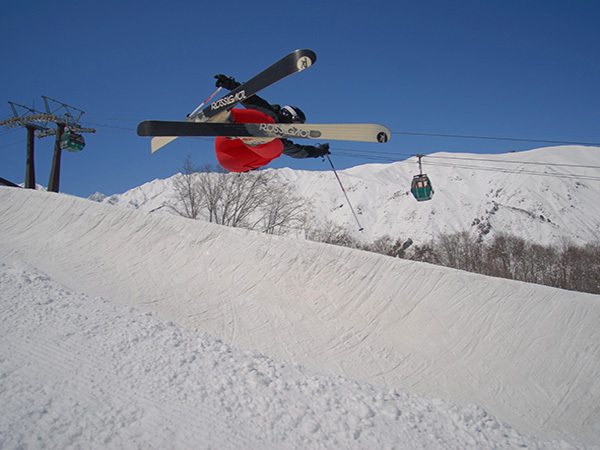 47 has Hakuba’s best terrain park, with a well-maintained half pipe, kickers that range from small to veritably huge, and a selection of rails and boxes. Two parallel lifts let you hit it again and again. 47’s park is popular with local seasonaires who often can’t make first lifts due to work on the breakfast shift. Get up their early and the lineups will usually be short. Pizza House Luis at the Hakuba 47 base area will give you proper thin-crust pizza with Italian and not-so- Italian (chicken and seaweed?!) toppings. In case your legs aren’t wobbling enough, they’ll serve you potent Trappist beer, or a refreshing Corona to enjoy while reflecting on another day’s fine sliding. Later in the season when the sun is higher and sets much later, finishing an hour early and relaxing with a beer at the 47 base is highly recommended.